6:15 am – Stretching in bed. 6:30 am – 4 Minute Morning (Week 3 DAY 7) – Make bed – wash up – get dressed. 7:00 am – make fresh smoothie with VEGA powder for kids + french toast, water. MY BREAKFAST: Small Banana – 1 1/2 Cup frozen Spinach, steamed, in a bowl with sweet potatoes/ yams, 2 soft boiled eggs, 1/4 tsp. kelp granules w/ cayenne, slice gala apple, 12 oz. water. 7:50 am – Leave house for morning commute to kids schools. First drop off at 8:05 am. Drive back home to pick up a forgotten item, drive to second location, arrive five minutes late. 8:55 – 9: 45 am – WORKOUT – 30 minutes Swim Drills + 4 minute Tabata of Treading Water + 15 minutes stretching in jacuzzi. 16 oz. Water. Shower/ change, 16 0z. water. 10:20 am – 11:00 am – Grocery store (chatted with a friend while shopping so I was there longer than usual). Arrive home, put groceries away. 11:15 am – MY LUNCH: 1/2 Cup Brown Rice, 1 Cup Sweet Potato/ Yams, Steamed Broccoli/Carrots/ Zucchini, 2 Chicken Drumsticks, 12 oz. water, 2 squares chocolate. 12:00 – 12:30 pm – Drive 14.5 year old dog to Vet for an injection for her arthritis. Spent one hour at the clinic. 1:30 – 2:00 pm – Drive dog home. She did her business in the car (poor girl) and lucky for me just a block from home. So add on 15 minutes of clean up once I got home. 2:15 pm – SNACK – 1/2 Cup Pumpkin/ Ginger Rice Noodles, 2 oz. 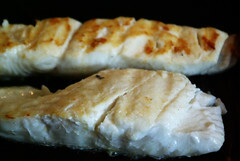 panfried Halibut w/ caramelized onions w/ 1/2 cup steamed Kale, 12 oz. Water. Laundry and tidy up house. 2:45 pm – Leave house to begin pick up from schools. First pick up at 3pm. Second pick up at 3:30pm. 3:45 pm – Arrive home and prepare after school snacks for kids. 4:15 pm – MY SNACK – approx. 40 of Mary’s Tomato & Chipotle Sticks, 1 tsp. Molasses, very small MacIntosh apple, half red pepper, 2 walnut halves, 1TBSP. Hemp Hearts. 4:45 pm – Drive both kids to Tennis lesson. 5:00 – 6:00 pm – Watch kids lesson (write today’s log while watching). 6:25 pm – Arrive home, prepare dinner while kids do homework. 6:45 pm – MY DINNER: snack on carrots, 12 oz. Water. 1 Cup Pumpkin / Ginger rice noodles with Lamb Stew. Few pieces of gala apple. 1 TBSP. Caramelized onions. Prepare some fish and vegetables for tomorrow. 12 oz. Water. Clean up kitchen. 8:00 – 8:30 pm – Kids to bed. 8:30 – 9:30 pm – write a new post about going to the vet today! 10:30 pm – Tidy up house, put laundry away. 11:00 pm – Lights out. Aim for 7 hours sleep.